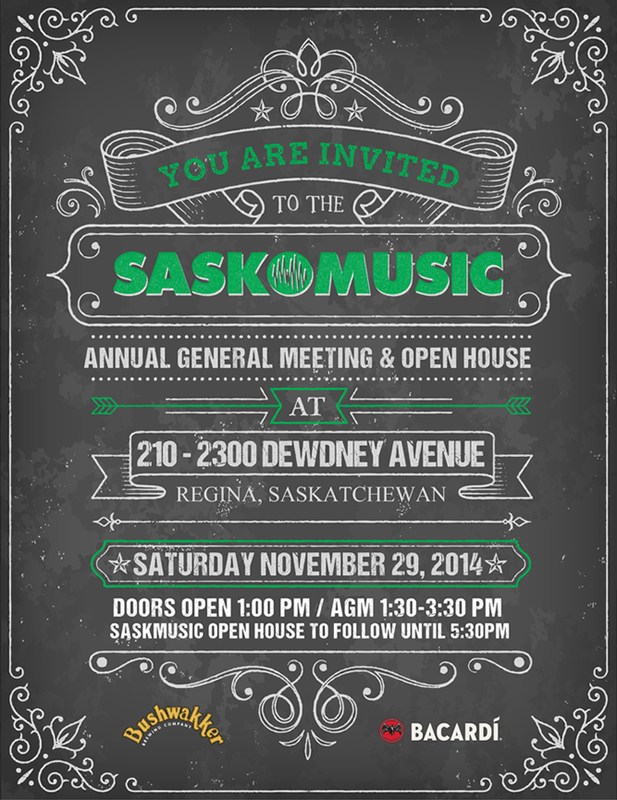 Current SaskMusic members and guests are invited to participate in our Annual General Meeting, in which we will discuss the past year's accomplishments, talk about the year ahead, and vote on our Board of Directors and proposed bylaw changes (click for more info & agenda). Then, everyone - artists, musicians, arts supporters and businesses alike - is invited to join us for our Open House, to run approximately 3:30-5:30pm. This will be a casual come-and-go party with some great food and beverages, with thanks to Creative Saskatchewan, Bushwakker Brewing Company and Bacardi. Come and join us for some early holiday cheer, and network with your fellows artists and industry! You are receiving this email as a opted-in Subscriber of SaskMusic, as a current member, or as a recently expired member of SaskMusic. If you no longer wish to receive email communications from SaskMusic, please click below. Please note that unsubscribing may result in your missing submission deadlines, and other opportunities and news, some of which is distributed only via email. To change the email address at which you receive these messages, please login to your SaskMusic account. Phone: 306-347-0676. Toll-Free in Sask: 1-800-347-0676. Copyright SaskMusic 2014. All rights reserved.